In nearly every scientific study, any purported benefits associated with drinking specifically revolve around “moderate” consumption. For some body weights, moderate consumption equates to one glass, which is 5 ounces. Because wine glasses come in different shapes and sizes, judging when you’ve poured enough can be difficult. 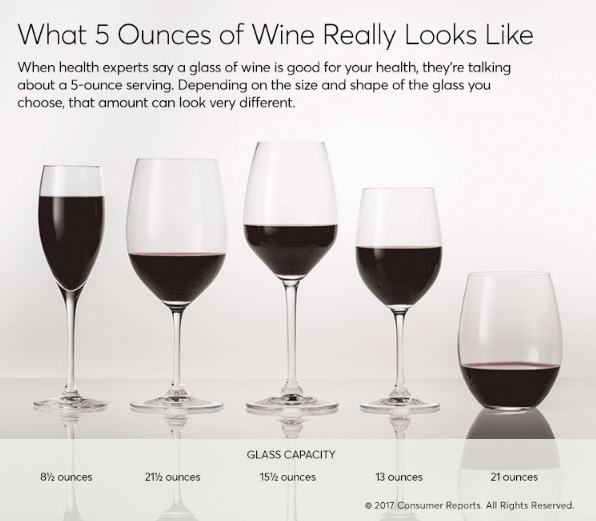 To help, the image below shows you what 5 ounces of wine looks like in different glasses. Photo: Wadyka, Sally. What 5 Ounces of Wine Really Looks Like. Digital image. Consumer Reports. 18 Feb. 2017. Web. Now that you know what the recommended amount of wine looks like, begin reaping all its health benefits. After observing 11,711 men for 16 years, a study found that those suffering high blood pressure were 30% less likely to have a heart attack if they drank in moderation. The Harvard School of Public Health study published their findings in Annals of Internal Medicine, 2007. Research has found that red-wine tannins contain procyanidins, which protect against heart disease. The study, published in Nature by the Queen Mary University in London in 2006, revealed that wines from Sardinia and southwest France have more procyanidins than other wines. Published in Diabetes Care, Amsterdam’s VU University Medical Center studied 369,862 individuals over an average of 12 years each. According to their research, moderate drinkers have 30 percent less chance of developing type 2 diabetes than nondrinkers. Published in Stroke, a study, conducted by Columbia University, followed 3,176 individuals over an eight-year period. After the study period, researchers found significant benefits to alcohol. When consumed in moderation, wine can reduce the possibility of suffering a blood clot–related stroke by about 50 percent. Published in Nature, researchers studied 1,379 participants from Iceland to ascertain if alcohol prevents cataracts. Compared to nondrinkers, moderate drinkers have a 32% less chance of getting cataracts. Additionally, those who drink wine are 43% less likely to develop cataracts than those drinking primarily beer. Stony Brook University conducted a study, involving 2,291 individuals, over a four-year period. Their results, published in the American Journal of Gastroenterology, found that moderate consumption of red wine reduces the risk of colon cancer by 45%. Interestingly, brain function declines at a noticeably faster rate in nondrinkers than in moderate drinkers. The supporting research, involving 1,416 participants, was published in Neuroepidemiology by Columbia University. Out of 2,468 men studied over a 29-year period, those who drank wine had a 34% lower mortality rate than beer or spirit drinkers. The Finnish study published their results in the Journals of Gerontology, 2007. Remember that moderation is key when consuming wine or any other kind of alcohol. For it at all to be healthful, stick to the 5 ounce serving. Moreover, ask your doctor if wine consumption is okay, especially if you take certain prescription drugs. Lastly, make sure you’re fully covered medically and financially by contacting a licensed agent today. They can help you find the health plan that’s right for you!